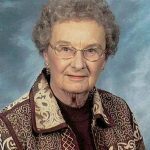 Betty Reed Sours, 97, passed away February 3, 2019 at home. Graveside service will be at Holly Hills Memorial Park in Granbury, Texas at 10:00 AM on Thursday, February 7, 2019. In lieu of flowers, it is requested that donations in Betty’s name be given to the Presbyterian Night Shelter or 1st Presbyterian Church Building Fund or to a charity of choice. Betty was born in Duluth, Minnesota on August 16, 1921 to Dr. and Mrs. R.R. Reed. She married her high school sweetheart in 1942. Their life for 29 years was in the Air Force. They lived in six different states and in Japan. They were blessed with two children Ray and Beth. Upon Col. Sours retirement from the Air Force they settled in Fort Worth where they were members of Ridglea Presbyterian Church. They moved to DeCordova Bend Estates and lived there for 28 years where Betty loved and played a lot of golf. After the death of her husband Lyle she returned to Fort Worth. She had been a member of Acton Methodist Church, was a present member of 1st Presbyterian, and a member of P.E.O. Her church, wherever she lived, and her faith and her family were the most important things in her life. She was preceded in death by her parents and her beloved husband of 55 years; sister: Barbara Franey; and brother: Robert Reed. She is survived by daughter: Beth McIntire and husband Dan; son: Ray Sours and wife Brenda; grandchildren: Meredith McIntire McClure and husband John, Mason McIntire and wife Lisa, Kevin Osborne, and Chris Osborne; great-Grandchildren: Cole McIntire, Owen McIntire, Quinn McClure, and Collin McClure. Be the first to share a memory of Betty .